Architectural practice Studio RHE has just completed Palatino, an iconic Italian restaurant on Central Street in Clerkenwell. Palatino is both the entrance space for newly opened co-working venue Fora Space, and a stand alone neighbourhood restaurant by Stevie Parle, chef-owner of the Dock Kitchen, Rotorino and Craft London. Studio RHE has created an elegant and pared back space to set the tone for both the professional and flexible ethos of Fora Space, also designed by Studio RHE, and the contemporary and unpretentious Roman food that defines Palatino. The architects worked with Stevie Parle from the outset to create an active all day restaurant. Palatino and Fora Space share an entrance off Central Street, through an architectural black steel revolving door and into a welcoming hotel concierge-style reception. This leads to a striking curved cast and fluted concrete bar that defines the restaurant space. The seating area combines banked seating with a scrubbed timber table running down the centre, for the serving of pizza bianco, sandwiches, salads, soups and coffee throughout the day. 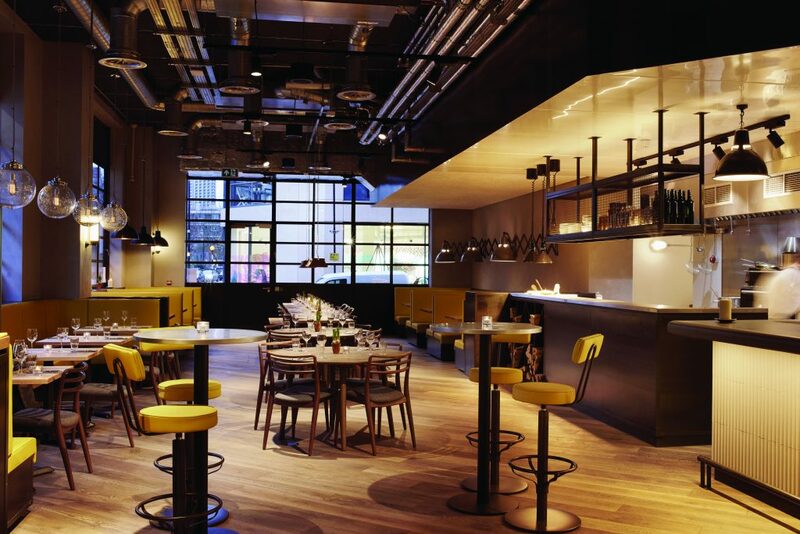 Running alongside the tables are more intimate banquettes upholstered in warm yellow leather. The banquettes are designed for meetings that can freely turn into lunches and dinners and vice versa. The material palette for the restaurant is informed by, and an integral part of the overall Fora Space concept, featuring exposed steel, black painted metal, muted grey walls and pale timber furniture. Palatino’s addition of bright yellow leather upholstery gives the space a distinctive and vibrant accent colour. http://www.studiorhe.com | Photography courtesy of Joe Woodhouse.